Collectia Ltd proudly offers reliable and affordable Southwest Kansas commercial garbage collection – up to 5 days per week - and as often as the customer needs. We have options to suit the trash removal demands of your business. Please contact our offices to set up greater Ulysses trash service for your large or small company. 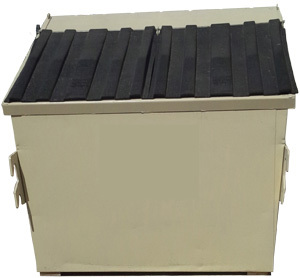 Commercial trash containers are provided to you for a small setting fee as part of your Ulysses area business trash removal service. Side Load 48" 31.5" 58"
Weather permitting, Collectia Ltd provides weekly or biweekly trash removal service to both homes and businesses in the greater Ulysses, KS area. If you have extra garbage or large items that will not fit in the commercial trash container, please call 620-356-4836 ahead of your normal commercial trash collection day. If you do not alert us of your extra or oversized items, our drivers will not collect these items.